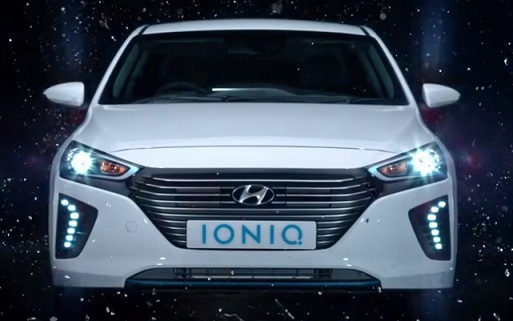 Hyundai UK has released a new TV ad, urging people to “Get more from every drop of fuel, with the IONIQ Hybrid,” WhatCar?’s Best Hybrid two years running. The 30-second spot, dubbed “The Amazing Drop of Fuel,” features a drop of fuel as it touches various objects, making them explode. A cassette, two red dices, a pink cake are all seen bursting in the air and spreading tiny pieces everywhere around. When one drop of fuel touches the Hyundai IONIQ Hybrid, though, the car lights up. Viewers get a glimpse at the vehicle’s cabin, which is enhanced by signature blue character lines on the dashboard, digital instrument cluster and seating. The D-Cut Steering Wheel boasts chrome-accented spokes, and beneath the front centre armrest is a multi-purpose storage compartment that easily accommodates a tablet. “IONIQ Hybrid. Get more from every drop of fuel,” an onscreen line reads at the end of the advert, which is scored by Strauss’ “An der schönen blauen Donau (The Blue Danube), Op. 314” performed by Orchestra of the Viennese Volksoper. The IONIQ Hybrid, with prices starting from £21,795, features a sleek, attractive coupé-style silhouette that combines, according to the automaker, “the best of traditional car design, with a forward-looking philosophy that hints at the future possibilities of low-emission cars”. Designed with aesthetics and efficiency in mind, it has “an aerodynamic profile with maximum efficiency and class-leading 0.24 coefficient of drag”. Hyundai states that, inside the IONIQ, “the weight of interior plastics has been reduced by approximately 20% through the use of a material made of recycled plastic combined with powdered wood and volcanic stone”. SE models feature a grey cloth seat trim, while Premium and Premium SE offer grey leather seat facings. In terms of performance, the compact electric motor works with the petrol engine to improve fuel economy and lower CO2 emissions and they also combine to maximize acceleration when required.